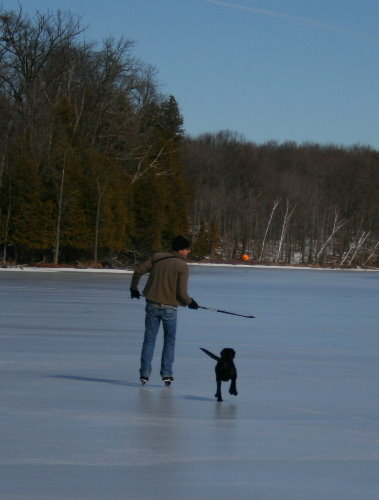 Yesterday was such a nice day that Dan and I decided to take Raven and go out on the lake for a skate. The warm weather last week had melted down the snow on the ice surface and smoothed it all out, so the lake was snow-free and relatively smooth, perfect for skating, something we hadn’t done since before Christmas. 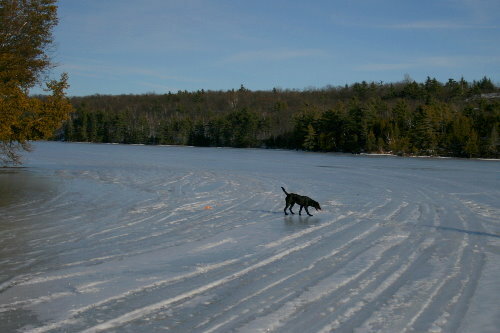 Despite that we’d had a few days of above freezing, though, the ice was too thick to melt enough to be a concern. A couple weeks ago our neighbour measured it at 23″ (58 cm), and peeks down through frozen-over ice fishing holes confirmed that it was still plenty thick, despite the warm temperatures. Our neighbours suggest that the ice will stay on the lake till April 15, give or take a couple of days, which means we’ve still got a couple months of frozen water, although I imagine the last few weeks as it starts warming up it’ll begin to thin out and become more unstable. We went out with the intention of being gone just an hour or so, but ended up spending the whole afternoon out. 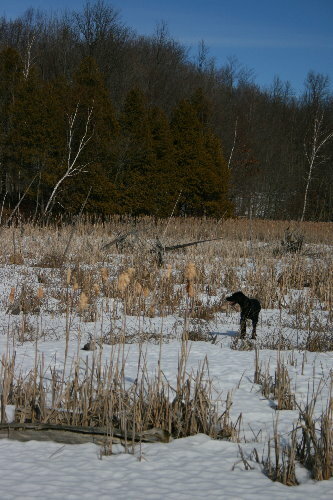 We skated up to the far end of the lake and dropped in on some neighbours we’ve gotten to know there. Dan hadn’t met them and I knew Raven would be thrilled to visit with them and their dogs. I told Dan it would just be a short visit, but he saw through that, he knows me too well. The skate was nice, though. Easy going, and considerably faster than walking. It’s about 3.5 km (2.2 miles) to the end of the lake one-way, and we tagged on a loop into the eastern bay (Kingsford is sort of Y-shaped, with one branch being the original river channel heading to the dam, and the other being an enclosed bay), so we probably did about 8 km (5 miles) of skating all told. The lake is interesting in that the residents are divided into two groups, a set of cottages along a private lane at the north end, and the houses and cottages along our road and the offshoot lanes down at the south end. 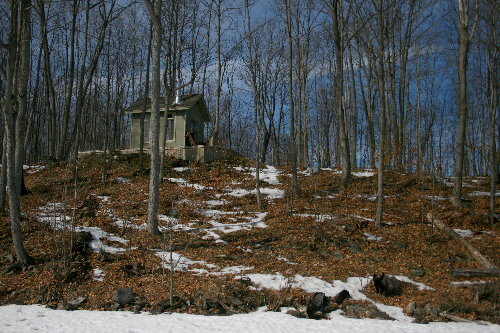 In between is no man’s land, aside from a couple of small cabins such as this one, barely large enough for a cot and a heater. The reason for this split is because the waterfront in the centre bit is too far from the road to be practical to run access in. Laying in a private lane, and then following that up with hydro, would add an extra hundred thousand or more to the price of your home. It’s funny the evidence of people that you come across, though. In one spot we found these metal chairs set up along the edge of the water, now acting as a grapevine arbour. I’m not sure if that was the original intention of their placement there or not. Just a short distance away was a little fence-like structure, also covered in grapevine, that may or may not have been built for the purpose. We swung by the wetlands we’d visited back in early winter, but because we had our skates on we didn’t go in to poke around (except for Raven). The wetlands are another reason the mid-section of the lake hasn’t been built on. Because they block easy access for boats or swimming, your effective waterfront would actually be a couple hundred yards out. Wetlands also affect what sorts of building restrictions are applied to your land (obviously more would be in place given the sensitivity of wetlands to runoff and other pollutants). The properties along that stretch would make great hunting or vacation retreats, and I do suspect waterfowl hunters take advantage of the proximity of the wetlands in the fall (we heard gunshots in that vicinity during that period), but it would probably not appeal to residents or serious cottagers. And then there’s the evidence of people you don’t like to see. 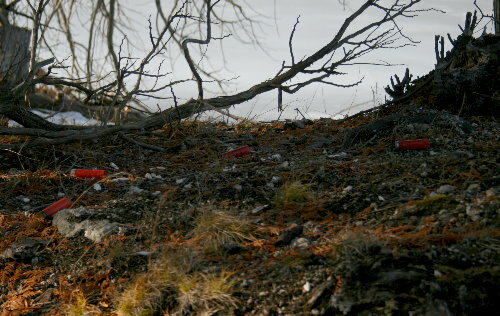 Shotgun shells dumped and left carelessly on a little island beside the wetlands. Some of them looked older, but some looked relatively new. I don’t think that gun hunting has been open since early December, though archery was still allowed for a while longer than that. Even if there isn’t someone potentially hunting out of season, at least clean up your mess before you leave. I’m not that keen on sport hunting, and things like this make me even less so. I believe this is the work of a muskrat. 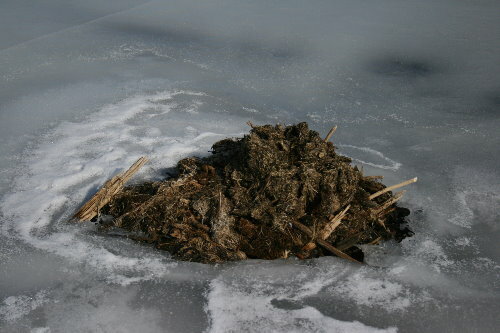 Called a “push-up”, muskrats make these piles in spots around frozen ice by either finding or making a hole in the ice (when the ice is thin) and then pushing submerged vegetation, fine roots and other debris up through the hole. 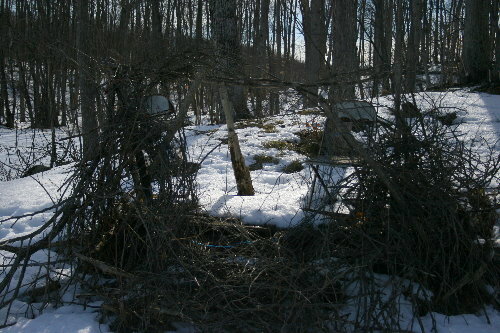 As they push more up, the pile grows and expands to create a dome-like structure over the hole. They then use these frozen dome covers as protection while still allowing them to come up for air and rest when away from their lodge. There were lots of these push-ups scattered about the lake, but mostly in the vicinity near the marshes. 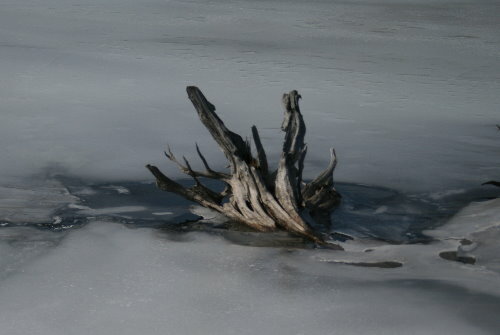 There was also a fair bit of open water around the base of a couple of stumps, and a small channel that cut through the ice for a little ways. We didn’t approach closely enough for me to take a good look, but I wondered whether it might have been the work of one of our lake residents, muskrat, beaver or otter. I still haven’t seen the otter myself, just their tracks that one time back in December. 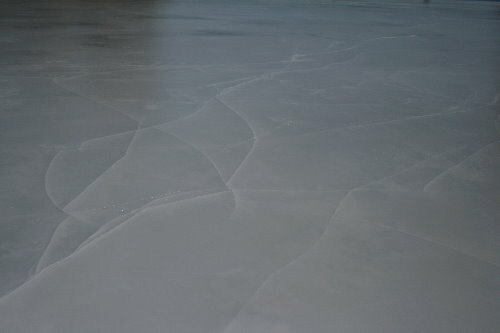 The entire lake was criss-crossed with these stress fractures, cracks that formed as the lake ice shifted and settled. Most of them only ran through the top two or three inches of ice and appeared to be just superficial. They were a bit disconcerting at first, but after the initial wariness wore off, it was interesting to look at the cobwebbing patterns they made on the ice surface. 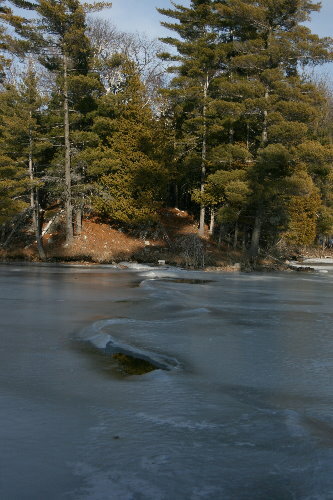 Another channel in the lake ice, going from a small island to the mainland. There were a few spots in the lake where the original river channel still carried the water swiftly enough to open it up before the rest of the lake, but I don’t think it goes through here. It may be another mammal corridor. This is also a mammal corridor, the sort with big machines on skis. The snowmobiles compacted the snow enough that when it all melted, the tracks remained in the ice, rendering it rough and bumpy. 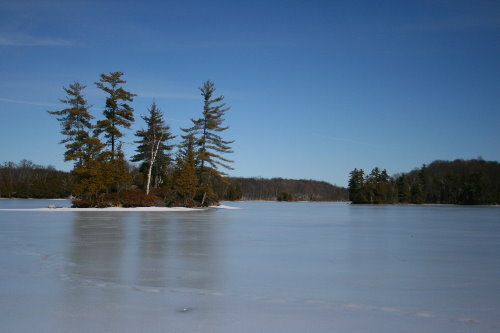 The snowmobilers were coming from the north cottages and going round into the enclosed bay. They’d taken the same track enough to really rough up the ice through this spot, making it difficult to navigate on skates. Other tracks, where they occurred just singly, could be glided over without too much trouble. I took so many photos during the outing. I didn’t realize just how many I’d taken until I got home and started going through them all. Ten to twelve photos is my limit on a post, so the other half will appear tomorrow. What a fun day! It was a joy to spend it with you without leaving the warmth of my house. I can relate to the “findings” as I hike the remote lake and ocean areas during the summer and witness much the same. Instead of the two-legged mammals and their machines across the ice, usually I see evidence of their existence through the bogs and marshes. What a mess they make. I esp. enjoyed your musings about the muskrat push-ups, etc. I always learn something new when I visit your posts. Interesting about the pushups, that they’re not just an uneven vegetation surface around which the ice froze, but deliberate muskrat bay windows. Will have to watch for these in the future.